From Burbank Studios, it's the Colgate Toothpaste Nakan Massacre Hour! This week's special guests: the crew of the starship Voyager! - The original pitch for this episode came from James Swallow, who wrote the premise for VOY: "One" and the DS9 prequel novel trilogy Terok Nor. 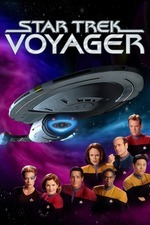 - The plot of this episode is similar to that of Season 3's "Remember" – Voyager personnel (in that case, just one – in this case, many) experience a terrible past event as if it were their own memories, after eyewitness accounts of the atrocity are telepathically implanted into their brains in the hopes that anyone who went through such a traumatic experience would do whatever they could to prevent it from ever happening again. - Tom Paris tells B'Elanna Torres that there were no remote controls in the 1950s. The remote she gives him was developed by Zenith in 1956, but remotes were not widespread until the MOS transistor was used in TVs, which was after 1960. Furthermore, Paris' knowledge of exact dates during the 20th century has been shown to be imprecise at best. "Words alone cannot convey the suffering. Words alone cannot prevent what happened here from happening again. Beyond words lies experience; beyond experience lies truth. Make this truth your own." - Chakotay, reading a translation of the memorial. "It's given us the chance to bond." "The bonding stopped when the sonic shower went offline." "Everything is perfect, except for one tiny detail." "They always said television was a bad influence." "The obelisk at Khitomer. The fields at Gettysburg. Those were other people's memories too, but we don't honor them any less." Whether or not Janeway's decision to reactivate the obelisk is a moral one is addressed at length by Bernd of Ex Astris Scientia here. Bernd seems to have stronger feelings about it than I do—he even includes a pretty darn comprehensive list of the Trek episodes whose concepts resemble this one's—but he does seem to have a point about the finale. It's like, it'd be better to reconfigure the obelisk so that it passively emits images and sound, accompanied by a "Press 1 to engage synaptic transmitter and relive these events. Press 2 to decline" or whatever. Instead, at the end of the episode, I got that familiar feeling of the writers introducing Profound-Seeming Notions without really thinking through the moral implications (see also "Nothing Human," the Crell Moset episode). Do you think that the writers intended the meta-irony of replaying the same story—that's about NOT replaying the same story? This episode adds Robert Stack (of The Untouchables) to the list of (mostly Earth) entertainers who canonically exist in the Trek universe. Kenneth Branagh and Conan O'Brien appear to be the most contemporary members of that category. This is an episode that gets worse the more that I think about it. At first, my objection was simply on a practical note: it makes no sense whatsoever to keep the obelisk active, even if you put up a few warning buoys. Neelix endangered numerous people with his episode in the mess hall, and the risk of someone endangering the entire ship goes up exponentially with the entire crew, more or less, affected. (And speaking of the entire crew, hey, Janeway, are you really OK with someone the age of Naomi Wildman getting that treatment? What if it's a space school bus full of kids that runs across it next time and their universal translator is on the fritz so they don't understand the warning buoys and get that horrorshow beamed into their young heads?) The whole point of the memorials at Khitomer and Gettysburg is that the attendee can experience them at the level and to the degree that they're capable and willing to endure. And, let me tell you, as someone who's visited Shiloh, just reading the written description of the battle was grim enough. Particle of the Week: Memory engrams serve the usual role this time. Pointless STO Comparison of the Week: This kind of scenario never came up in the MMO that I recall. * How does Tom Paris not know about commercials? TORRES: That is called a jingle. According to the research I did, they inserted them into the entertainment programs. I know, it's confusing, but I kept them in for authenticity. I realize Tom's knowledge of 20th century stuff is necessarily imperfect, but that's a hell of a detail to miss. * This is morally repugnant, as discussed already. This is almost exactly what I came here to say: we're clearly meant to agree with Janeway's decision, when the whole thing is really a half-baked false dichotomy. They had plenty of other choices to honor the dead, many of which carried a lower risk of a small child being held at gunpoint by anybody. It might help some people understand the reality of the massacre if they're in denial of the reality of the situation; on the other hand (and this is a really horrifying possibility), you might have some people going in for the experience because they enjoy that sort of thing. * Voyager left some game breaking weapons technology laying around. Regardless of how this beacon was intended originally, it has the potential to be misused as a devastating weapon. A directed version of the transmitter (or an autonomous drone or one operated by a shielded crew) could take out almost any crew using stock Alpha Quadrant defenses. They shouldn't have left such a dangerous advancement laying around - they should've studied it to work out a defense, and dismantled it afterward just to prevent the area's murderhobos from reverse engineering some kind of Fear Beam. Anyway... yeah. Wasn't happy with this story one bit, even though it didn't get under my skin the way some of these have been known to. I haven't seen this one in forever. Does anybody in it cite the Prime Directive? It sounds like an argument could be made that due to Starfleet's policy of non-interference, they'd be forced to leave the obelisk active. The link to the in-canon list of entertainers is fascinating and could eat up a good chunk of my day if I let it. The sad thing about the Conan O'Brien shout-out is that he probably wouldn't care that he's canonical in Trek. He can get awfully snarky about geek stuff, probably from growing up geeky himself. (Maybe he'd privately think it was cool, but his public response would be to push an invisible pair of glasses up his nose and say Truly, the greatest of honors in his nerdiest of voices.) Too bad it wasn't Colbert. He'd probably put a footnote on his tombstone alongside something written in Elvish. This'd be the other weird detail: not one word about the Prime Directive. I suppose it's murky enough that it might not apply in this scenario because the people are dead, probably warp capable (due to the kind of weaponry used), and their intent to run the beacon seemed clear, but it was still a bizarre thing to leave out of the discussion. Too bad it wasn't Colbert. He'd probably put a footnote on his tombstone alongside something written in Elvish. And at some point Disco should put Colbert on in a cameo at least. He'd make a great Andorian. The thing is, the obelisk is running out of power--and they do interfere, to keep it going indefinitely. Oh! Then maybe they were violating the Prime Directive, by giving the obelisk more power? I really don't remember this one well enough to speculate about it. He'd make a great Andorian. Why is that so easy to picture? I can't really imagine him as a Klingon or a Romulan or whatever, but he just seems like a natural Andorian somehow. Then maybe they were violating the Prime Directive, by giving the obelisk more power? That's my personal take. Jack's right: we can't know for certain because nobody's ever laid the Prime Directive out in canon, but this feels like a violation of the spirit of non-interference anyway. Why is that so easy to picture? I blame Enterprise - Stephen Colbert's onscreen persona reminds me of Jeffrey Combs' Andorian character there. Like... the obvious mugging/fronting? I was thinking of him more as a TOS Andorian. They were sinister in an oily, campy way, and that seems like something he'd have fun with. I can also picture him as a Vorta, maybe. I can also picture him as a Vorta, maybe. Farscape ran an episode somewhat similar to this in their third season, called "...Different Destinations." I preferred their take on the participate-in-the-memorial concept. It was more tightly written, offering a greater sense of urgency and a deeper, more poignant sense of why such remembrances are established. This was a decent episode, but it wasn't nearly as good.